Well folks, no pics today. I went to get my photo lights out of the cupboard. My wife stacked her grandfathers old accordian on top of them. So today I ordered a new and better set of lights. Once the fog burns off in the morning, I may try some sunlight pics. ouch, jamesp, a 300 dollar fine is a lot of money for having a little fun on a jet ski. Many thanks for the warnings about the dam release and will definitely check for release times and fishing license requirements. Sure don't want to get fined by a game warden. Hopefully, when the weather is warm and Rick has some time off from work, we can head out and scout for garnets. Very sorry to hear about your lights, jakesrocks, and glad you ordered some. Sunlight pics would be nice though! Wow ginger! That is an awesome collection! Did you grab a few of the 'Bama garnets off of your computer screen that jamesp posted? Master Crafter of Homemade Lapidary equipment! Gosh, drocknut, I'm sorry to read that you don't have cabbing equipment. I hope you are able to get a machine soon to accompany your beautiful wire wraps and creations. I used to use a nail salon tool, wet/dry automotive sandpaper, and knife sharpening blocks to cab materials, then polished with Turtle Wax polishing compound. It takes long time to cab a stone, but you can watch tv while you cab. Welo opals are fun to cab using this method. WOW Gingeerkid, THAT is DEDICATION! W/D Does work but takes for EVER! I don't got no real equipment either but check out my HAHA 50mm Flat Lap Machine under "Homemade equipment Posts". Thank you, @tumbleon & lennyb0b! Sure hate to hear that the prong broke, @tumbleon. 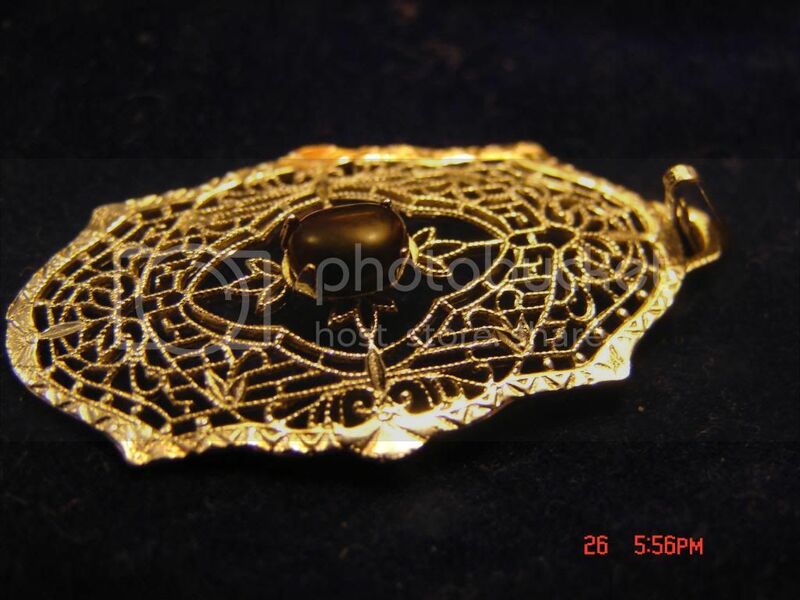 That would've made a pretty garnet pendant. Have you used your tumbled garnets to create any other pieces? Jan, here is my garnet in schist. I bought it at the rockshop in Prineville, Oregon. It was love at first sight! I'd like to know how it was formed. Any idea the source? It's about the size of the palm of my hand. Taken with the new copy stand. No shake, but still have to figure out the lighting and focus. Spessartine Garnets & Smokey Quartz. -- Tongbei Area, Fujian Provence, China. gingerkid, your garnet collection is nothing short of awe inspiring! I'm jealous. I've collected several green Grossulars over the years and a few of them have that deep green color that most Demantoids seem to have. Any info on what makes a Demantoid a Demantoid? Is it just an arbitrary trade name based on richness of hue? Demantoid is a variety of Andradite garnet. It's a calcium/iron garnet. 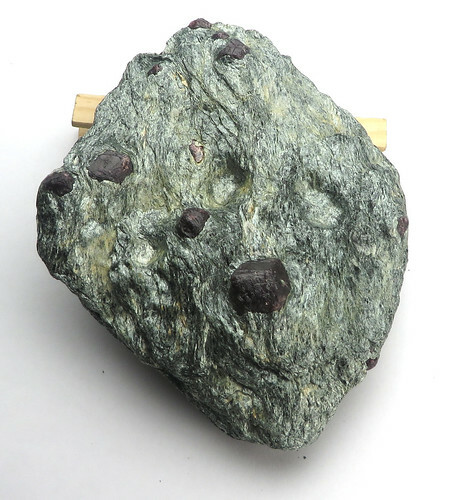 Grossular garnets are a calcium/aluminum garnet. The green color is probably due to trace amounts of chromium. The more chromium, the deeper the green color. I've collected several green Grossulars over the years and a few of them have that deep green color that most Demantoids seem to have. Any info on what makes a Demantoid a Demantoid? Is it just an arbitrary trade name based on richness of hue? If you have cuttable clean green grossulars you have valuable stones. Can you reveal the general area where they were collected? Apart from the major sources in Africa (Kenya, Tanzania and Madagascar) the only other important localitiy I'm aware of is Asbestos, Quebec. jakesrocks, gemfeller, thanks guys. There are so many garnet varieties, "sub-varieties", and trade names...It's maddening, I tell you. Yeah, Tsavorite is what I should have referenced I guess. Not Demantoid. We have something called Hydrogrossular here in WA State. I think you can find them in Cali as well...It can take on many different appearances in its own right. So many garnets, so little time! A Washington friend brought me a large chunk of the massive form of Hydrogrossular a few years back. Still haven't sliced it, but it looks like nice material. 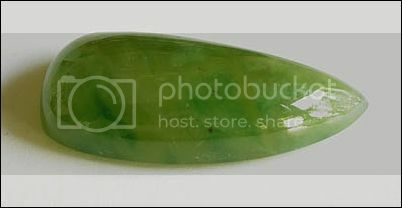 Hydrogrossular, mis-named Transvaal Jade, was originally found in South Africa. It can make very beautiful cut stones in green, pinkish-red and green/red combinations called "watermelon." I have examples in my photo library but can't post them because I'm working with a new computer and my software is in a total snarl. Rick, the friend who brought me the material sent a piece to a lab for analysis. It was in fact Hydrogrossular. He has filed a claim on the deposit, and is keeping the location secret at this time. He was chasing down a jade location when he stumbled on this deposit. About all I can tell you about the location is that it's a 1-1/2 day hike into high country to get to it. He also ran onto a deposit of high grade Listwanite near the Hydrogrossular deposit. He also brought me a chunk of that to play with. It isn't Californite. I've collected that material myself when I lived in California. If anyone knows of other books on the subject of garnets, please list them. I'm trying to fill gaps in my rock and fossil books library. Don, authoritative books on garnets are hard to come by. Some good ones have been written but they go out of print quickly. When they show up on used booklists the prices are usually insane. A good one that might show up as used is a classic, "Garnet" by John D. Rouse, Butterworths Gem Books, ISBN 0408-01534-9. A friend at Caltech alerted me to a copy in their bookstore about 10 years ago and it's my basic garnet textbook. Another excellent book is the Lithographie text "Garnet: Great Balls of Fire," <www.lithographie.org> ISBN 3-921656-35-4. Gorgeous photos! One of the best books on garnet(IMO) but hard to come by is Dr. William Hanneman's original edition of "Naming Gem Garnets." He put out a second edition but it's no substitute for the first. Sinkankas's several books about gemstones of North America also contain numerous really important references to garnet and its complexity. Thank you Rick. I'll put all of those books on my "Most Wanted" list. Maybe I'll find one or two. Tell me about out of print books being expensive ! After months of searching I found a very old out of print book on fossils. More or less the fossil bible. That one cost me $150.00, and that was cheap. I've since seen the same book going for $500.00 and more.